I am spicing up my snack time these day, going an extra step and actually preparing a little something rather then just eating a pound of carrots. Yes yes, a pound of carrots is a great snack, but there are so many other fantastic veggies awaiting my belly and I can only accommodate so much at once. So today the carrots had to wait, it's time for the parsnips. After I made this and was eating it with all smiles and glee, I had the mr take a taste to see what he thought. What I learned is that If you do not like parsnips then you will not like this dish. But if you are awesome and do like parsnips, well then you will like this. But I guess if you like parsnips but don't like cranberries then you might actually not like this either. So what I guess I am saying is if you like parsnips and cranberries, you will freaking love this. And this, these cranberry roasted parsnips, are great as a snack or as a fantastic accompaniment to any meal that you will be serving anytime soon. It's quick and easy and delivers in all sorts of good ways, if you like cranberries and parsnips. The stuff. Parsnip. fresh (or frozen) cranberries, a little maple syrup, olive oil, and salt and pepper. Keeping it simple and just chopping the parsnip up into mouth sized pieces. 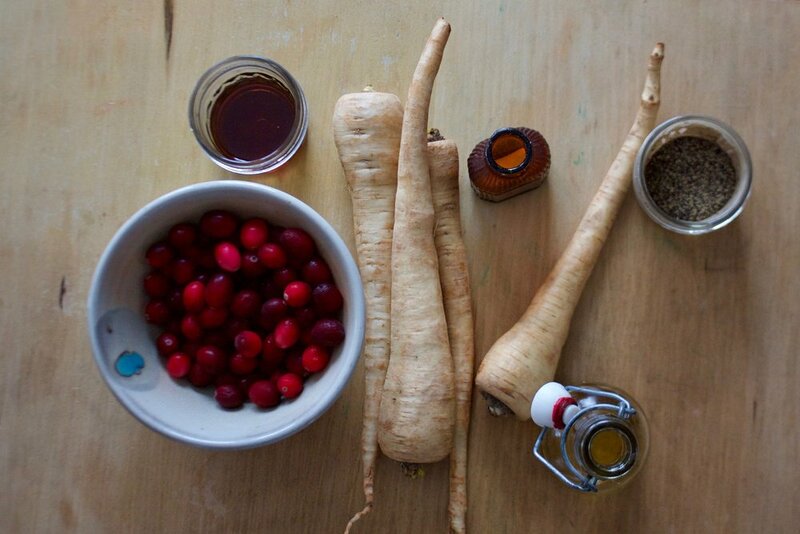 If you are a peeler, go ahead and peel those parsnips first. Me, never a peeler. A little trick I have learned when roasting veggies is to roast them in a really hot cast iron pan. What I usually do is preheat the oven and while I am doing that I preheat the pan on the stove top. It gets hot fast and the veggies roast better when tossed into a hot pan. You can also preheat whatever dish you are using in the oven while it preheating. Whatever works for you. So parsnips Into a cast iron pan (or any oven safe dish) tossed with just a touch of olive oil and salt and pepper. Parsnips cook pretty fast so after about 15 minutes check for doneness. 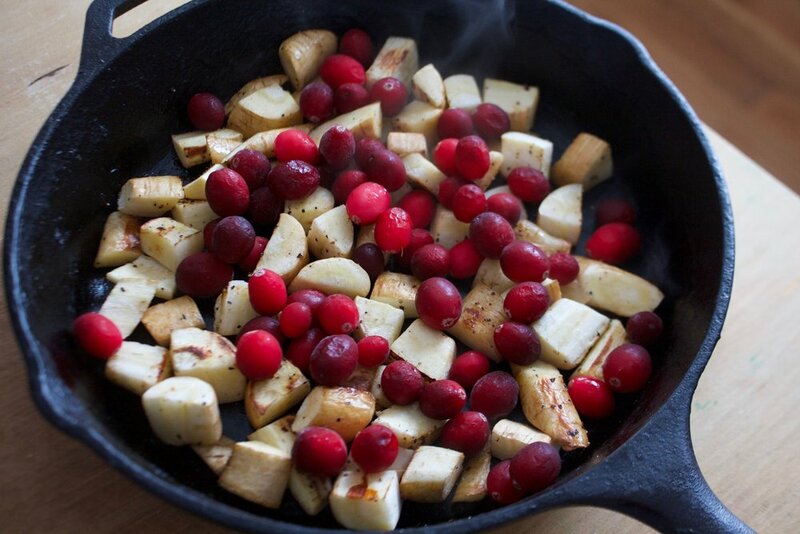 Once they are for tender and browning, toss the cranberries into the pan and keeping roasting. There you go. Simple, fast, and oh so delicious. Grab whatever pan or oven safe dish you are using and preheat either place it in the oven while its preheating of if you can place it on the stove, get it really hot on a high flame.